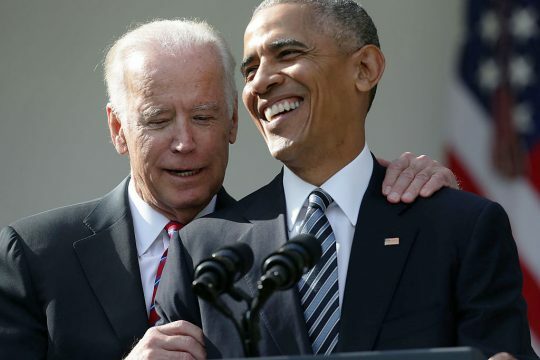 Former President Barack Obama has remained silent on the allegations of inappropriate touching against his vice president and close friend Joe Biden. Other 2020 presidential candidates have spoken about the allegations, as well as party leaders like Speaker Nancy Pelosi (D., Calif.), who advised Biden to pretend everyone has a cold. However, Obama hasn't been quoted in any reports or tweeted any expressions of support for Biden, with whom he was close during his eight years in office and to whom he bestowed the Presidential Medal of Freedom. Biden released a video Wednesday pledging to be more "mindful and respectful of people’s personal space," following several women expressing discomfort over his physical contact with them in prior interactions. The hits against the 76-year-old, who is considering running for president, are raising concerns about his political viability, although he continues to lead Democratic polls and remains highly popular in the party. Biden was well-known for his tactile style as vice president, such as in this compilation video of him hugging and kissing women and even pressing his face against theirs while swearing in a new class of senators. Obama saluted Biden as a "brother" in his farewell address. "You were the first decision I made as a nominee, and it was the best," Obama said. "Not just because you have been a great Vice President, but because in the bargain I gained a brother. And we love you and Jill like family, and your friendship has been one of the great joys of our lives." Former Obama senior adviser Valerie Jarrett defended Biden in a series of media appearances this week, saying she never saw him engage in inappropriate behavior. Former National Security Adviser Susan Rice and State Department spokeswoman Jen Psaki have also spoken out on Biden's behalf. One woman, former Nevada Assemblywoman Lucy Flores, wrote last week that Biden grabbed her shoulders and kissed her on the head in a way that made her feel "gross" in 2014. Another woman described Biden putting his hand around her neck and touching his nose to hers in 2009. Two other women alleging touching that made them uncomfortable came forward on Tuesday.